Happy 30th birthday Windows! 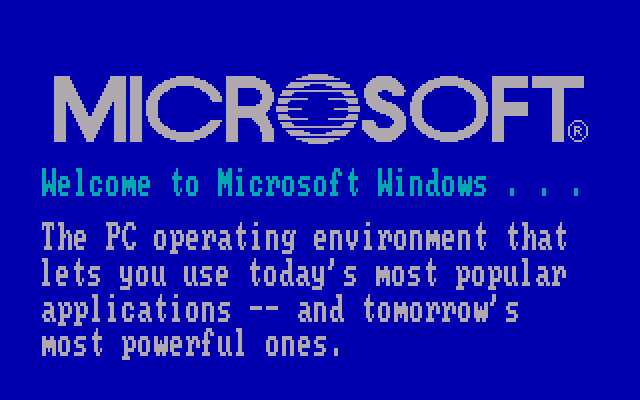 What's your earliest memory of Microsoft's revolutionary operating system? I first started using Windows back in 1992, shortly after the release of Windows 3.1, and I’ve used every iteration since, including both the good (Windows XP, Windows 7) and the bad (Vista, Windows 8). Every time a new version was released, I upgraded pretty much immediately. I might own various Apple devices, and dip into Linux products from time to time, but for me there will only ever be one desktop operating system of worth, and that’s Windows. Today is a huge milestone for the operating system that popularized home computing, and changed the world in so many ways. Microsoft Windows 1.0 was released on 20th November 1985, two years after it was first announced, and for the first time PC owners were able to control things using a mouse, rather than just typing in commands in DOS. Windows 1.0 wasn't an operating system, but rather a 16-bit multi-tasking shell that ran on top of MS-DOS, but even so it was revolutionary and opened up the PC's appeal significantly. In the early days of Microsoft, the company's co-founder and visionary Bill Gates famously talked about wanting to see "a computer on every desk and in every home", and Windows 1.0 was the first real step in making that a dream a reality. There are drop-down menus, scroll bars, icons, and dialog boxes that make programs easier to learn and use. You're able to switch among several programs without having to quit and restart each one. Windows 1.0 ships with several programs, including MS‑DOS file management, Paint, Windows Writer, Notepad, Calculator, and a calendar, card file, and clock to help you manage day-to-day activities. There’s even a game -- Reversi. Windows 1.0 sold half a million copies before it was replaced by Windows 2.0 in late 1987, a hugely impressive number back then, and helped by a very attractive price point of just $99. Windows has changed significantly over the past 30 years, as you would expect -- the Control Panel was introduced in Windows 2.0, the Start menu and taskbar first appeared in Windows 95 -- but you can still see those early origins in today’s OS. 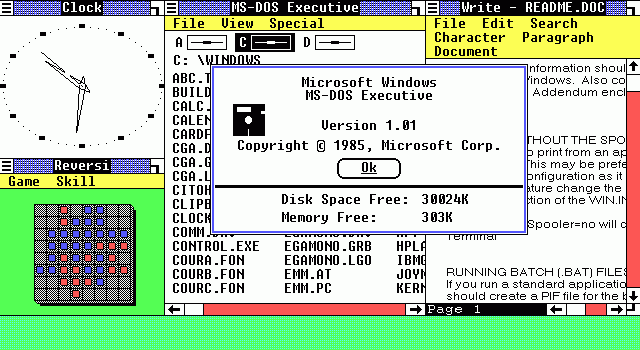 To celebrate Windows hitting its 30th year, we’d like to know what your earliest memory of Windows is. What was the first version you ever used, and how did you come to use it? Leave your comments below.